Sunday after church I announced, like I was making the most important declaration of my life, "I feel like baking today." 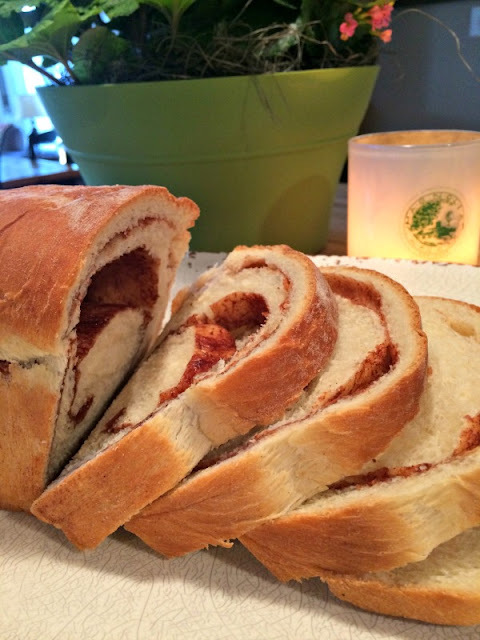 Truth be told, I had a craving, a wish, a hankering if you will, for some cinnamon bread. Which I made and then posted on Instagram and Facebook and so many people asked me for the recipe that I had to share it with you today. Slight sidebar before we go any further. 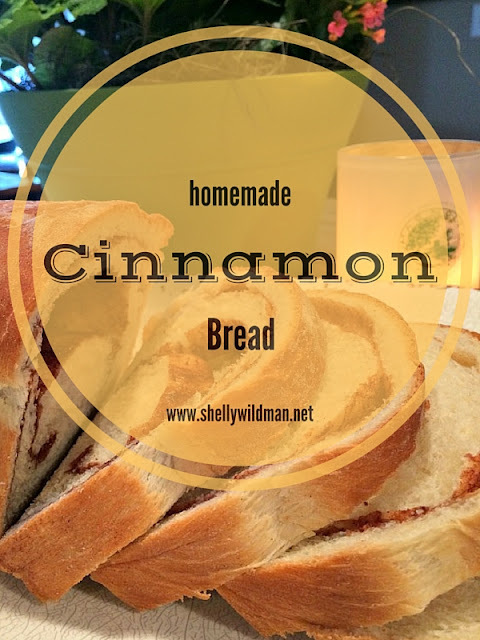 I should let you in on something important: I tried to make cinnamon bread a couple of weeks earlier but failed. It hurts to even say that, but it's true--I failed. Big time. My dough didn't rise. It just sat like a lump in the bottom of the bowl doing nothing, and after two hours I just picked the whole mess up and threw it away. I've never done that before. Never. You should know, however, that even though I've never had to throw out bread dough before, I have all sorts of other kitchen failures. Pizzas (yes, even the frozen ones) burn. Cakes turn out dry. Cookies don't always come out beautiful and soft and delicious. I've even had a failure or two when I've had company coming, which is never very much fun. Even with this recipe. To get the good pictures that I got in the end, I had to make this recipe twice in one day. Because I realized that the first time I made it, I put too much water in the recipe (that's the only thing I did wrong) and my loaves turned out GIGANTIC!!! So weird. But the second time I followed my recipe to a "T" and everything turned out just fine. So to those of you who think you can't make bread or dough or anything with yeast, I'm here to tell you, you can. You can do this. You'll be fine. Just take a deep breath and dive on in. Follow my instructions, measure carefully, use yeast that isn't expired, and you too will be enjoying the most delicious loaf of bread you've ever tasted. You may never buy your bread at the grocery store again. Anyway, Easter is coming next week and this bread would be amazing with an Easter brunch. You could add Breakfast Won Tons (we're having those on Easter, for sure) and maybe some Blueberry Coffee Cake. For a spring-y main dish, how about Spring Green Risotto alongside a delicious Easter ham? And then perhaps Amy's Lemon Cake or some Lemon Squares for dessert? Now that would be a fabulous Easter dinner! Hungry yet? Ready to make some bread? Here we go. First, combine some yeast with warm water (110-115 degrees and, yes, I do check the temperature) and two teaspoons sugar. (This is a little trick I learned a couple of years ago--the yeast feeds on the sugar and gets bubbly quicker. It really works!) Let that sit for five minutes until it's really bubbly like this. Next, heat 1 C. whole milk (use whole milk if you can--the fat in the milk makes a richer dough) to scalding. Once it's warmed, add a stick of softened butter, 1/2 C. sugar, and 1 1/2 teaspoons salt. Let that sit for a few minutes until the butter is melted and everything has combined, then pour it into your mixing bowl. 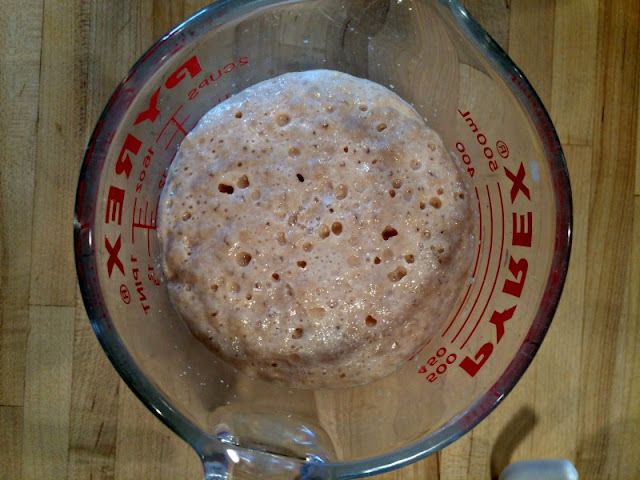 Add the yeast to the bowl and stir everything together. 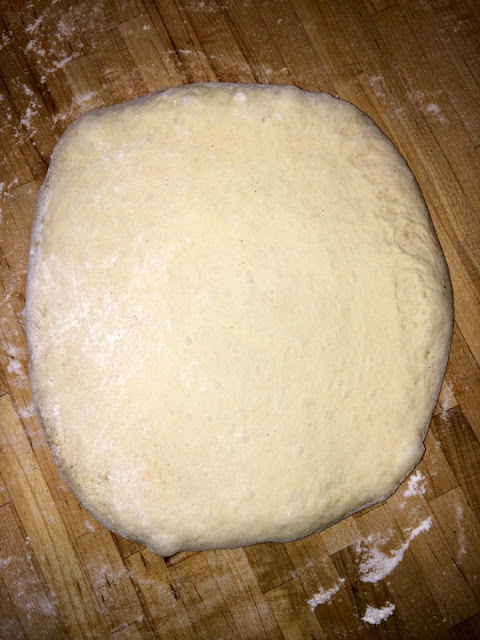 Using the paddle attachment, mix in about 3 cups bread flour, then add smaller amounts of flour until the mixture resembles a sticky dough. 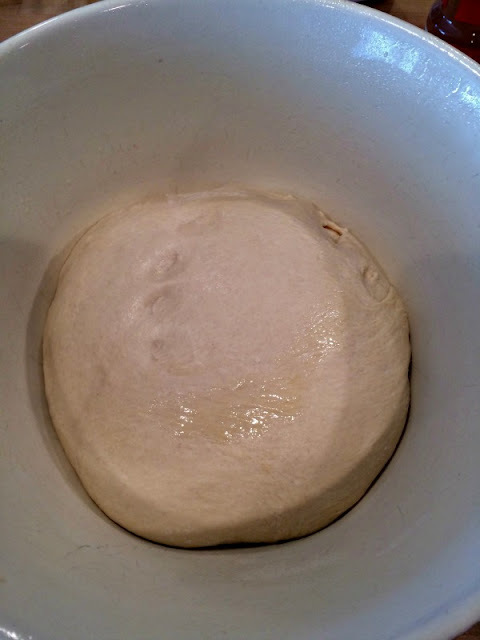 Turn up the mixer and knead the dough for about five minutes, adding a tablespoon or two of flour as needed to make a soft dough that pulls from the sides of the bowl. When everything is beautiful and soft and squishy, turn the dough onto a floured surface and form it into a ball, then place it in a greased bowl, cover with plastic wrap and let it sit in a warm place until doubled in size. When the dough is nice and big, turn it onto a floured surface, divide it in half, and form each half into a ball. Roll each ball into a nine-inch square(ish) . . .
Now, here's where you have to be very careful. 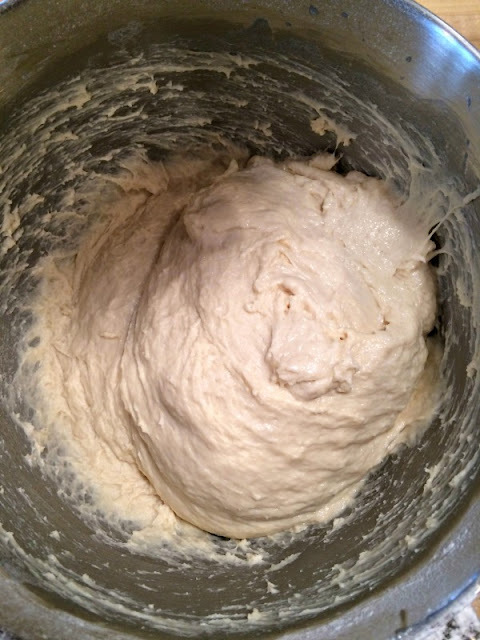 Starting at one side, roll the dough tightly. If you don't roll it tightly, your bread will have gaps inside it after it's baked (see my example below) and you don't want that. You want a nice, uniform piece of bread that has a nice swirl of gooey cinnamon running throughout it. 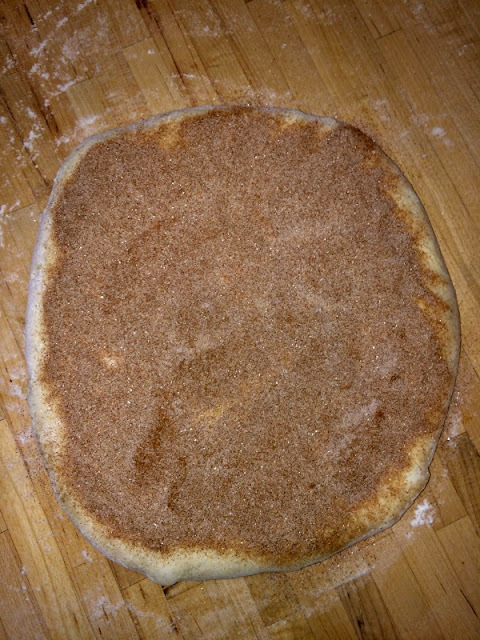 Take your roll of dough and cinnamon sugar and place it, seam side down, in a bread pan. Cover with a towel and let rise for about another hour until the dough comes to the top of the pan. Now bake your loaves for about 30 minutes at 350 degrees and voila! When the warm loaves come out of the oven, brush them with some melted butter for an even more beautiful, glossy finish. 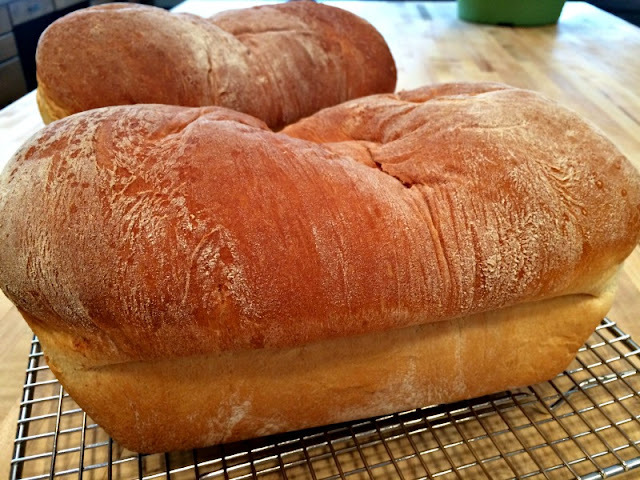 I know there is no way you'll be able to resist this bread--it's best when it's warm anyway--but give it a few minutes to rest before cutting into it. And then, enjoy this ooey-gooey, cinnamon-y richness. I'd love to know if you try this or any of my recipes. Why not post a picture on Instagram and tag me on it? I'd love to see your creations! Sign up for email updates by clicking here. 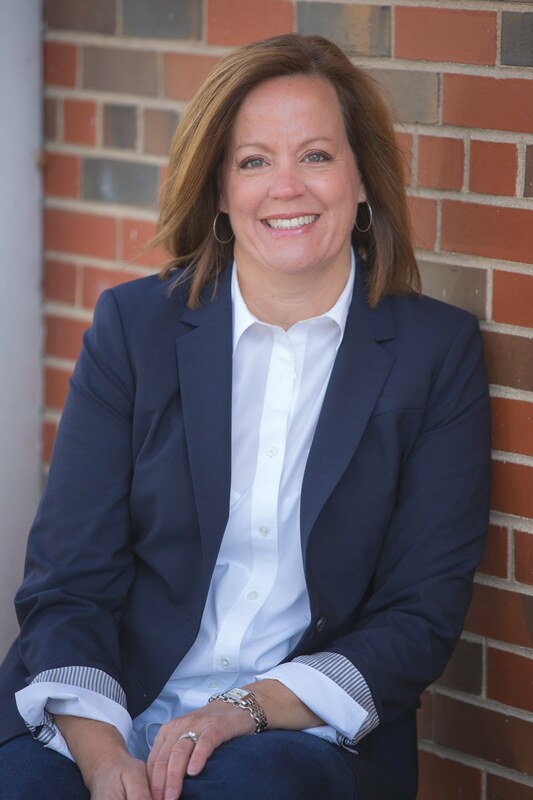 Follow me on Facebook, Twitter, and Instagram.